If you’re considering starting a business after the service look no further than VetConnection from JAN-PRO. 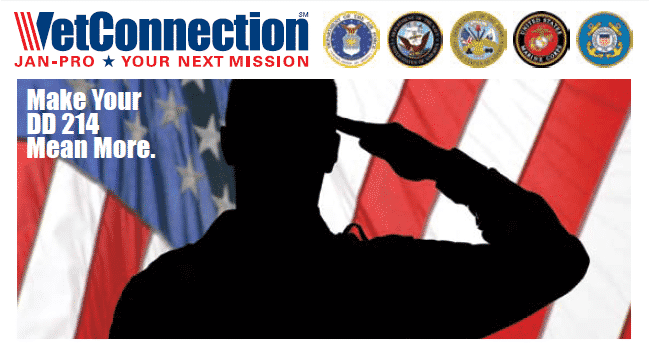 VetConnection is the first branded franchise commercial cleaning program created exclusively for veterans, and it’s from JAN-PRO, a recognized global leader in the industry. VetConnection offers you the chance to join over 10,000 franchisees, many of whom are veterans just like you, who have built their own successful businesses by following the JAN-PRO model. You’ll receive comprehensive training and support, and JAN-PRO will even provide your customers for you, so you do not need prior sales experience..
You choose the market you want to start your business in, the plan level that best suits your needs, and how you will finance your business. You can even decide how fast you want to grow and expand your business. JAN-PRO offers partial financing for qualifying franchisees, and as a veteran you will also receive special finance incentives that could mean additional discounts of up to 15%.